Aim: This study was designed to assess the oral health knowledge, attitude, practice of caretakers and to gather information on feeding and oral hygiene habits of children in baby day care centres of Bangalore city. Settings and Design: A descriptive cross-sectional study using self-administered questionnaire conducted at day care centres of Bangalore city. Methods and Material: Data was gathered on the number and location of all baby day care centres from a telephone directory of Bangalore city. All the caretakers who provided written consent for participation were included in the study. A total of 260 caretakers completed a 60 point self-administered questionnaire. SPSS Version 13 was used to obtain descriptive statistics. Results: A Child's dental visit need not be scheduled until the need arises according to 32.93% of the caretakers. Irregular visits to the dentist were found to be common, and 24.39% said toothache was the major driving factor for the dental visits. Troublesome children were bottle fed during naptime by 20.33% caretakers. Fifty one percent of caretakers make the children rinse their mouths' with water after they had food whereas; only 2.03% caretakers make the children brush their teeth. Conclusions: The results of this study indicated that caretaker's attitude towards oral health care needs is far from acceptable standards to bare any positive impact on the children. Aim: To determine the age of Juvenile patients based on Third Molar Development in population belonging to Namakkal district for Forensic application. Methodology: The data was collected from the Orthopantamograms (OPG) which was regularly taken for different purposes in K.S.R institute of Dental Science & Research Outpatient Department. A retrospective analysis of these OPG's was conducted for different developmental stages given by Dimerjian et al. in 1973 for the age group of 14 to 25 years. SPSS version 10.0 was used for statistical analysis. Results: Mean Ages of the juveniles were calculated using the developmental stages of the Third molar and it was found that there was significant variation between the mean ages for different developmental stages. This implies that there exists definite ethnic variation in development of Third Molar and thus their mean ages also. Discussion: The described data may provide the third molar developmental stages and its mean age of the calcification for people belonging to Namakkal district only. Further researches are warranted in other populations as Third molar development shows definite ethnic variations, which is evident from the present study. Hence this could be used as a tool for age identification in forensic odontology for a sub group of Indian Population. Background: Early detection and Prevention are integral components of the health agenda and areas taking on increasing importance and emphasis. Apart from prevention, early detection and prompt referral for diagnosis offer the best hope to the patient with cancer, providing the best chance of a cure Objectives: The purpose of the study was to assess Bangalore dentists self reported knowledge and practices concerning oral cancer prevention and early detection, dentists' capacity to detect and manage oral cancer and counsel their patients about risk reduction. Method: A sample to represent dentists in Bangalore yielded 200 dentists of which 180 responded to a 32 item questionnaire. Result: Of the total 200 dentists 180 (90%) of them took part in the study. Over 62% of the dentists reported providing oral cancer examinations. Most (66.7%) of them had detected at least one suspicious lesion in the past year, with seven(3.5%)detecting greater than five lesions and 29.8% had detected none. Many (87.8%) of the dentists had not received any oral cancer continuing education and very few (12.2%) had received the oral cancer continuing education. Training in risk counseling was rarely reported. Only 5.5% were confident in their counseling skills. All the dentists feel that they should be trained and are interested in both tobacco cessation and alcohol abuse counseling. Conclusion: Interventions are needed to ensure appropriate skill and knowledge levels for oral cancer early detection, management, risk counseling by the dentists. Aim : To find out Oral Health Status and Treatment Needs of the students aged 10-18 years in Jawahar Navodaya Vidyalays, Maharashtra. Setting and design: The study was carried out amongst 3500 students in the age range of 10 -18 years of Jawahar Navodaya Vidyalays using WHO Oral Health Assessment form (1997) in few selected districts of Maharashtra. Type III clinical examination (ADA 1970) was carried out using mouth mirror and a CPI probe. A two stage sampling technique was applied. Kappa statistics was applied to check for the intra examiner reliability. Data obtained was presented using descriptive epidemiological methods. Results and conclusions: The overall caries prevalence in the survey subjects in the permanent dentition was 22.11% and an almost equal number who were having caries had not taken any treatment for it (both in the deciduous and permanent dentition). Mean number of decayed permanent teeth per person was 1. Mean number of teeth per subject requiring one surface filling was 0.67. Percentage of subjects with calculus was 55%. Mean number of sextants with bleeding or higher score, calculus or higher score was 3.48/2.50 respectively. Percentage of the subjects with malocclusion was 40.5% in 12-18yrs. The study clearly indicated lack of oral health care services. Practicing good oral health habits is a fundamental necessity to maintain oral health. Proper oral health habits are developed through the traditional K-A-B(knowledge-attitude-behaviour) model of education. Since auxiliary health personnel specialize in preventive information and health promotion, it is important that their own oral health knowledge is good and their oral health behavior conforms to professional recommendations. For the study, the home science college students are taken up as even they deal with health related sciences and health promotion. They are also associated with maternal and child care. Objectives: To assess the knowledge, attitude and practices related to dental health among the home science students. To design appropriate dental health education programs specifically aimed at home science students Methodology: A questionnaire was distributed to the PUC, degree and MSc students (n 500) in the home science college, Bangalore during the academic year 2004-2005. The questionnaire consisted of questions that could assess their oral health behavior, knowledge and practices. The data was processed by SPSS and analysed using chi square test and analysis of variance (ANOVA) Results: 60% of the students brushed twice daily which matched with the international recommendations. 38% knew the role of fluorides in the prevention of dental caries. Knowledge about ideal interval to visit a dentist was significant among these students. The knowledge regarding dental treatment during pregnancy was poor among all the students. Conclusion: The results of the present study highlighted the limited knowledge regarding periodontal health and dental caries among the PUC and Degree students. It may be concluded that the Home Science college students seemed to have appropriate knowledge on some oral health topics, but limited knowledge on the others. Context: Oral Cancer presents with high mortality rates and the likelihood of survival is remarkably better when detected early. Dental profession shares an important responsibility towards early screening, prompt referral and treatment. Aims: To assess oral cancer knowledge, attitude and screening practices of practicing dentists in Bangalore city. Methods and Material: A descriptive cross-sectional study was conducted on 250 dental practitioners. A comprehensive 24 item questionnaire was employed to assess the aims of the study. Statistical analysis used: Descriptive statistics were calculated using the SPSS 13.0. Results: A total of 250 Practicing Dentists were approached out of which, 240 provided consent for participation. The response rate was 96%. About 138 (58%) respondents agreed that their knowledge about oral cancer is not up date. The prevalence of oral cancer increased in the fourth and the fifth decades of life according to 142 (59%) subjects. The use of alcohol was identified as a major risk factor for oral cancer causation by 238 (99%) subjects. The habits related to tobacco and alcohol use by their patients was recorded by 164 (68%) subjects. Forty seven subjects (68%) believe that health education alone is not sufficient to change the behaviour of the patient. Conclusions: Being able to routinely detect oral cancer at an early stage and council patients in prevention is a continuous challenge for dental profession. Dentists must be familiar with the risk factor, clinical signs and symptoms of oral cancer if they are to be effective in identifying, referring and counselling high-risk patients. Good oral health in childhood has long lasting beneficial effect for the rest of an individual life, with increasing evidence of general health benefits as well. Dental caries experience is an evolving phenomenon. Better understanding the fundamental nature of caries, the role of risk assessment tool and the implications of these concepts for clinical care and population-based programmes is essential for developing and applying strategic approaches aimed at minimizing the impact of caries and promoting optimal oral health throughout childhood. This paper provides an overview for understanding fundamental nature of Dental Caries, Caries Risk Assessment Tool and efforts to minimize its consequences in light of available scientific evidence through Strategic Intervention. In India where the situation is very different from other countries, with a population of 1.15 million in 2009 (the second largest in the world); it is likely that more people will fall prey to mass disasters. The dentist population ratio looks quite grim in rural India scenario which houses majority of the population. There has to be a proper disaster plan which should include surveillance, referral of patients, diagnosis and monitoring, triage, immunizations, medications, infection control and role of dental society towards disaster response. Dentists are acknowledged widely as leaders in preventive oral health care. Services provided by dentists potentially include education, risk communication, diagnosis, surveillance and definite treatment, etc. Majority of the public probably would not think of their dentists as being a first responder during a mass disaster. Dentists can play a crucial role from surveillance and education, to emergency response, hence we strongly urge that a high priority be set for providing these professionals with the knowledge and training necessary to improve their ability to respond effectively in such events. This is an attempt made to see the efficacy of dentist's related policy measures to mitigate the adverse effects of disasters in India. ERGONOMICS is a way to work smarter-not harder by designing tools, equipment, work stations and tasks to fit the job to the worker--NOT the worker to the job. It is a perfect balance between job characteristics and human capabilities. Ergonomics is multidisciplinary and requires knowledge in three main areas that is anatomy and physiology, psychology and technology, so a system has to be designed which should lead to less of fatigue, discomfort, injury or chronic health disorders. A system in dental practice, which brings about this change, is Dental Ergonomics. Aim: To assess the awareness of medico-legal issues among medical and dental college health professionals of Vadodara. Materials and Methods: A cross-sectional survey was conducted among health professionals of Vadodara city. A total of 245 health professionals (96 medical land 149 dental) participated in the study. A structured, self designed questionnaire was used for collection of data. Chi-square test was used to compare the awareness of medico-legal issues between medical and dental health professionals, at p < j0.05 level of significance. Results: The study results reveals that, 35.10%, 36.32% & 28.57% participants had poor, fair, and good w\awareness regarding medico-legal issues respectively. No statistically significant difference was observed between medical land dental health professionals regarding medico-legal issues and also with regards to their designations. Conclusion: The results illustrated that, most of the participants were unaware of medico-legal issues and showed an immediate need to update the understanding of these issues to be on a legally safer side. Dental caries an ancient disease afflicted humans since centuries, the pattern of occurrence is not stable and varies globally. It is on the higher end in few countries and manifests itself in the lower end in others. It shows a different picture within the country and amongst the countries and the factors influencing this includes, political, social, economic and commercial changes that have occurred in these countries other than dental care delivery. The study of change in distribution of dental caries, helps in planning, policy making and also to prevent and control of this pandemic disease. The present paper is an attempt to review the global scenario of dental caries amongst 12 year old, and reasons for such a trend. Introduction: Dental health care setups are found to generate both infectious and hazardous waste, so it is the time for us to get oriented, sensitized and trained to manage health care wastes scientifically. Aim of the study: To study the awareness and practices of Dental care waste management among Dentists in Chennai City. Objectives: 1. To assess the dentist's awareness about dental care waste management. 2. To know the various methods of bio-medical waste disposal practiced by private dental practitioners in Chennai City. 3. To assess the awareness of dentists regarding colour coding of biomedical wastes. Materials and methods: A cross sectional questionnaire study was conducted among 250 private dental practitioners selected by simple random sampling.A pretested questionnaire consisting of 28 close ended questions divided into two sections was used. Results: Out of 250 participants 167(66.8%) were males and 83(33.2%) were females.About 14.8% of the dentists were not aware of the different categories of bio-medical waste generated in their clinic.About 28% of the dentists were not aware of the bio-medical waste management law in India and the same number (28%) were not aware of the colour coding for different types of biomedical wastes. Conclusion: The present study indicates that the majorities of the dental practitioners were not aware of the different categories of biomedical waste and are not practicing the appropriate method of waste disposal. There is an urgent need for continuing dental education on dental care waste management for the dental practitioners. Dental caries is multi-factorial with sugar consumption being the most important factor. Sugared items are the most relished substances by the children. They consume it and develop dental caries even in their early childhood. Aim: To assess the association between sweet score and dental caries experience among 12-13 year school children in Chennai. Materials and Methods: Study population includes 317 children, 179 children from rural school and 138 children from urban school. Sweet score was assessed using Niezel and Pappas 24 hour diet method and dental caries was measured using DMFT index. Data collected was analyzed using Chi square test and Spearman's rank co-efficient correlation. Result: Statistical test showed significant difference between rural and urban population based on sweet score ( 2 14.064, p 0.029). The mean DMFT of urban school children was 1.89 and rural school was 0.92. There was no significant difference between rural and urban population based on mean DMFT ( 2 47.354, p 0.263). Spearman's rank co-efficient correlation shows no significant correlation between sweet score and dental caries. Results also showed majority of the study population 68.11% in urban and 67.03% in rural were in the 'watch-out zone', indicating the need of diet counseling among school children. Oral health is an essential component of health throughout life. Millions of Individuals suffer from dental caries and periodontal disease, resulting in unnecessary pain, difficulty in chewing, swallowing and speaking, and increased medical costs; hence, the present study was conducted to evaluate the oral health status of school children which would help us in planning and implementing necessary preventive measures. Aim: To assess the Oral health status and treatment needs of a residential school children aged 3-15 years in Chennai city. Objectives: 1. To assess the Oral health status and treatment needs of residential school children Aged 3-15 years in Chennai city using the criteria of WHO basic oral health survey proforma (1997). 2. To evolve a data base on oral health status and treatment needs of the Study population for future planning and implementation of dental public health program. Materials and Methods: The study participants (n 422) were 3-15 years aged children of sushil hari international residential school. Data was recorded by WHO proforma and analyzed using SPSS version16.Statistical significance was determined by using Kruskal-Wallis One Way ANOVA followed by Mann-Whitney U-Test and the level of significance was set at P 0.05. Results: The mean dmft between males and females was 1.12 and 0.72 which was statistically significant. The mean dmft between different age group was 2.05, 0.97 and 0.00 which was statistically significant. The mean DMFT between males and females was 0.41 and 0.32 which was statistically significant. The mean dmft between different age group was 2.05, 0.97 and 0.00 which was statistically significant. Optimal oral health is necessary for over all health of an individual. The measures of oral diseases like caries and periodontitis by using various indices provide little insight into the impact of these disorders on daily living and quality of life. Therefore it is important to understand how people perceive the impact of oral diseases on their quality of life. Oral health-related quality of life (OHRQL) is a relatively new but rapidly growing concept with various instruments designed to measure it. 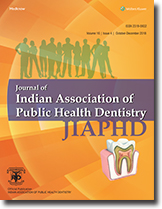 This paper reviews regarding the development and use of these oral health related QoL measures and includes an appraisal of future research needs in this area pertaining India. Background: A number of oral diseases and disorders have been associated with diabetes mellitus and periodontitis has been identified as a possible risk factor for poor metabolic control in subjects with diabetes. The presence of Candida species and the density of candidal growth in the oral cavity is often said to be increased in patients with diabetes mellitus. Various herbs possess anti diabetic property. Possessing antimicrobial property thus gives an added benefit. Objective: To evaluate the in vitro antimicrobial activity of Gymnema sylvestre (madhunashini), Azadirachta indica (neem), Piper longum (long pepper) and Cinnamomum tamala (Indian bay leaf) on Candida albicans, Porphyromonas gingivalis and Aggregatibacter actinomycetemcomitans and to assess the minimal inhibitory concentrations of the extracts against the three microorganisms. Methodology: All the herbs were dried and powdered. Solvent extracts were obtained with methanol by maceration followed by filtration and evaporation. The antimicrobial efficacy was assessed using agar well technique. The minimal inhibitory concentration was assessed using serial tube dilution technique. Results: Neem showed the highest antifungal activity against C. albicans, followed by madhunashini, bay leaf and long pepper. Only madhunashini showed antimicrobial activity against P. gingivalis. Neem showed the highest antibacterial activity against A. actinomycetemcomitans, followed by madhunashini. Conclusion: This study points to the probable antimicrobial effect of some solvent extracts of antidiabetic herbs against C. albicans, P. gingivalis and A. actinomycetemcomitans. The antidiabetic property of these herbs coupled with the demonstrated antimicrobial property can lead to cheap and readily available natural drugs for the control of diabetes and associated periodontal disease and candidiasis. Background: A number of oral diseases and disorders have been associated with diabetes mellitus and periodontitis has been identified as a possible risk factor for poor metabolic control in subjects with diabetes. The presence of Candida species and the density of candidal growth in the oral cavity is often said to be increased in patients with diabetes mellitus. Stevia is a new crop in that is gaining very high popularity amongst all type of sweetener users as most ideal substitute for sugar. Possessing antimicrobial property thus gives an added benefit. Objective: To evaluate the in vitro antimicrobial activity of stevioside on Candida albicans, Porphyromonas gingivalis and Aggregatibacter actinomycetemcomitans and to assess the minimal inhibitory concentrations of stevioside extract against the three organisms. Methodology: Pure powder of Stevioside, glycoside extracted from Stevia rebaudiana , was obtained. 100% pure solutions of stevioside was prepared by mixing well the appropriate amount of stevioside with an inert solvent di methyl sulfoxide (negative control). The antimicrobial efficacy was assessed using agar well technique. The minimal inhibitory concentration was assessed using serial tube dilution technique. Results: At the end of 48 hours, stevioside showed statistically significant antimicrobial activity against all the three micro organisms tested in comparison to the control. The zone of inhibition demonstrated against C. albicans was maximum. Conclusion: This study points to the probable antimicrobial effect of stevioside against C. albicans, P. gingivalis and A. actinomycetemcomitans. The antidiabetic property of stevioside coupled with the demonstrated antimicrobial property can lead to cheap and readily available natural drugs for the control of diabetes, periodontal disease and candidiasis. Background: Antimicrobial properties of spices have been documented in ancient literature and the interest continues to the present for their medicinal effects apart from their routine use for flavour and aroma. Candida albicans is a normal commensal of oral cavity, although overgrowth observed in immuno-compromised condition. Hence, there is a need for continuous search for new, effective and affordable antimicrobial agents. Objectives: To evaluate the antimicrobial activity of turmeric (Curcuma longa), clove (Syzygium aromaticum) and ginger (Zingiber officinale) and to assess the minimal inhibitory concentration of spice extracts against Candida albicans. Methodology: The spices were dried and powdered. Solvent extracts were obtained by treating spices in soxhlet extractor with ethanol followed by evaporation and concentration. The antimicrobial activity of spice extracts were assessed using agar well diffusion technique and minimum inhibitory concentration (MIC) of spice extracts was tested. Results: The spice extracts emerged as potent antifungal agents against Candida albicans. Clove showed maximum antifungal activity followed by turmeric and ginger. Among the concentrations tested, 50% concentration of all spices, showed maximum zone of inhibition followed by 25% and 12.5%. The clove had the lowest MIC value compared with the turmeric and the ginger. Conclusion: All the spice extracts were found to inhibit Candida albicans effectively. Clove emerged as a potent inhibitor of Candida albicans. Spice extracts may be useful source for the development of novel formulations against opportunistic infection caused by Candida albicans. Background: The field of alternative medicine has seen a tremendous growth over the past few years. The interest in plants with antibacterial and anti-inflammatory activity has increased as a consequence of current problems associated with the wide-scale misuse of antibiotics that induced microbial drug resistance. Objective: 1.To evaluate effect of herbal extracts of Azadirachta indica, Punica granatum and Acacia nilotica against common oral microbes. 2. To compare effect of herbal extracts of Azadirachta indica, Punica granatum and Acacia nilotica against common oral microbes with chlorhexidine. 3. To assess the minimal inhibitory concentrations of stevioside extracts against the three organisms. Methodology: The P. granatumpeel was separated, dried and powdered. A. nilotica bark obtained from the tree was powdered. A. indica leaves obtained from the tree were dried and powdered. Solvent extracts were prepared using Soxhlet apparatus. Antimicrobial activity was tested using agar ditch plate method. Zone of inhibition on all four sides was measured in millimeters with vernier caliper after 48 hours. One way Analysis of Variance (ANOVA) test was used for multiple group comparisons followed by Tukey post hoc for group wise comparisons. p-value 0.05 was considered statistically significant. Results: All three herbal extracts showed antimicrobial properties against the tested micro oraganisms. The maximum antimicrobial activity was shown by A. nilotica extract. Conclusion: Results showed that these herbs can be used as antiplaque agents as they are cheap and easily available. In vivo studies are needed to prove or refute their efficacy and safety in real environmental circumstances. Background: Spices has been described down the ages for their medicinal effects apart from their routine use for flavour and aroma. The antimicrobial properties of spice extracts have been recognized and used since antiquity. Streptococcus mutans plays a major role in initiating dental caries process. Hence timely prevention and control of Streptococcus mutans in the oral cavity is necessary. Objectives: To evaluate the antimicrobial activity of turmeric (Curcuma longa), clove (Syzygium aromaticum) and ginger (Zingiber officinale) and to assess the minimal inhibitory concentration of spice extracts against Streptococcus mutans. Methodology: The spices were dried and powdered. Solvent extracts were obtained by treating spices in soxhlet extractor with ethanol followed by evaporation and concentration. The antimicrobial activity of spice extracts were assessed using agar well technique and minimum inhibitory concentration (MIC) of spice extracts were tested. Results: The ethanolic extracts of spices were effective as antibacterial against Streptococcus mutans. Clove showed maximum antibacterial activity followed by turmeric and ginger. Among the concentrations tested, 50% concentration of all spices, showed maximum zone of inhibition followed by 25% and 12.5%. The clove had the lowest MIC value compared with the turmeric and the ginger. Conclusion: All the spice extracts were found to inhibit Streptococcus mutans effectively. Clove emerged as a potent inhibitor of Streptococcus mutans. These plant extracts may be useful sources for the development of novel herbal antibacterial formulations against Streptococcus mutans. Advertising or marketing is a vital part of any one's life. People do make many if not most of their purchasing decisions on the basis of advertisements. Dentists themselves make purchasing decisions on the basis of advertising. In today's competitive, consumer-oriented society, dentist must learn the marketing skills. Informing the public about his or her services, can be as much a part of his dental armamentarium as the high-speed hand piece. This article explores potential and methods of marketing in dental practice. Background: Traumatic injuries, especially fracture of anterior teeth are a tragic but often ignored problem among young children. There is perhaps no single dental disturbance that has greater psychological impact on both parent and the child than the loss or fracture of child's anterior teeth. Multiple causes contribute to tooth trauma, with the major focus on falls and collisions, sporting activities, domestic violence, automobile accidents and assaults. Aims & objectives: To know the prevalence of traumatic injuries to permanent anterior teeth among 8-15 years old government and private school children in Bangalore city. Materials & methods: Study group consisted of 2000 government and private school children between the ages of 8-15 years old in Bangalore city selected by simple random sampling. The study was conducted from January 2008 to July 2008. Information regarding patient's demographic profile and any history of trauma affecting permanent teeth were recorded using structured proforma. The data was then processed and analyzed using the chi square test and the student t test (p value 0.05). Results: The prevalence of anterior tooth trauma was 14.5%. The prevalence of tooth trauma in private school children was 15.9% and in government school children was 13.0%. More of boys (17.3%) had history of trauma than girls (11.4%). The maxillary central incisors were most commonly involved by trauma (89.6%). Maximum teeth involved by trauma had fractures confined to enamel (81.6%). The main cause of trauma was indoor falls (27.3%). The trauma occurred most frequently at home (35.4%). The frequency of injuries was 7.9% in children with normal overjet (0-3 mm), 49.6% in children with increased overjet (3.1-6mm) and 54.2% in children with extreme overjet ( 6 mm). Among children with traumatized teeth 78.5% had type I malocclusion. Conclusion: The prevalence of traumatic injuries to permanent anterior teeth was higher among private school children compared to government school children. Also, the prevalence of traumatic injuries was more among children with increased maxillary overjet, in children with type I malocclusion, and more in boys when compared to girls. Introduction: Health is multi - factorial which lies both within the individual and externally in the society in which he or she lives. Studies in the past among factory workers and miners have revealed the high prevalence of Dental caries and periodontal disease which is associated with poor oral hygiene maintenance, poor dental attendance, and tobacco habits etc. Objectives: Objectives of this study are to assess and compare oral health status and treatment needs of granite factory employees in Nanjangud Taluk with general population also to suggest possible measures to improve their oral health status. Method: A Descriptive Cross sectional survey was conducted on 453 granite factory employees in Thandya industrial area, Nanjangud Taluk. A simple random sampling was used to select 450 subjects as comparative group from Thandavapura village. Community Periodontal Index, Loss of attachment and Dental caries experience was recorded according to WHO oral health assessment (1997). Data was analyzed using SPSS version. Results: Prevalence of periodontal disease was higher among factory employees which was 96% compared to general population (90.9%) (P 0.001). Whereas prevalence of dental caries was higher among general population which was 63.3% compared to 49.4% among factory employees (P 0.003). While highest prevalence of periodontal disease and dental caries was seen highest in transportation unit workers (99.2% and 58.1%). Conclusion: Our study showed that factory employees are more affected by periodontal diseases which might be due to high use tobacco habits and poor oral hygiene habits. General population exhibited higher prevalence of caries which might be due to high rate of sweet consumption. Background Dental practitioners are exposed to a variety of risks in routine practice like Infections, physical, chemical, psychological, and radiologic hazards. There are scarce data from India regarding the prevalence of such disorders faced by the dentists in private practice. Objectives To report occupational hazards and health complaints among dentists in private practice in Bangalore city. Methodology The authors interviewed 150 dentists in full/part time private practice for 3 years, selected by Simple random sampling from the Karnataka state dental directory 2002. They were interviewed personally and the data was recorded. They collected the demographic information, disorders related to practice and ageing and lifestyle. Data was analyzed using Excel (Microsoft 2007) and STATA 11.1. Results Of the 150 practitioners surveyed, male: female ratio was 1.8:1, majority were in the age group of 30-39 years. About Majority 70.7% were undergraduates (BDS) and 29.4% were postgraduates (MDS). Each of these dentists treated about 5-20 patients/day. The various disorders reported were musculoskeletal - cervical spondylitis (42%), Spinal Spondylitis (30.7%) and hand pain/ arthritis (11.3%), hypertension (36.7%), Ischemic heart diseases (0.7%), varicose vein (19.3%), anxiety disorders (38%), Glove allergy (19.3%), chemical allergies (24.0%) and contact dermatitis (18.0%). Conclusions Dentists are vulnerable to various work- related hazards and also medical disorders related to stress. Reducing the risks of hazards could be achieved by increasing awareness and to eliminating all known sources of occupational hazards by suggesting preventive measures and investigating the risk factors for such hazards. Overall general health of human beings is quite influenced by oral Health. Or we could simply say that having bad oral health puts us at a high risk of developing other health problems such as cardiovascular disease, diabetes, pulmonary disease and pre-term low birth weight infants. The aim of the present article is to present a review of the current literature available. Current available data shows mixed observations, suggesting though some relationship exists between periodontal disease and various systemic diseases, yet periodontal therapy in such patients does not necessarily reduce the occurrence or progression of these diseases. Therefore, further research in this field is warranted for better understanding of these issues, which could be put in use to open new avenues for prevention of these diseases. Purpose of the Study: To Assess the Oral Health Knowledge and Attitude of Final Year Nursing Undergraduate Students. Methodology: A questionnaire study was conducted in five nursing colleges in Bangalore city selected by simple random sampling .The total number of final year nursing undergraduates was 254 out of which 208 where present on the day of survey. The study group provided answers to a 26 item questionnaire that was grouped into six dimensions. Data analysis was done using spss 11.0 for windows and systat 8.0. Z-test was used to find the significance between assumed proportion and observed proportion. Results: 10% of the participants were males, 91.% knew how many permanent teeth are present in a healthy adult but only 51.% knew how many deciduous teeth are present in a healthy child. More than 50% of the nursing students had adequate knowledge in oral hygiene practice. In identifying oral disease, the student nurses have good knowledge in identifying calculus and plaque, reason for gum bleeding, early identification of tooth decay and hazards of tobacco chewing. They are not clear about the number of dental specialties, 35% said there are 9 specialties and 34% said there were only 7. Student nurses were not able to identify the treatment provided by a periodontist as about 40% said they fill teeth. Unanimously, the student nurses said they want to work in preventive and community dentistry and they also want to learn more about the oral cavity and oral diseases. Conclusions: The student nurses are confused in some aspects like number of deciduous teeth in a healthy child, what kind of a tooth brush should be used, how often the brush should be changed, what kind of tongue cleaner is preferable, what treatment does a periodontitis perform and what needs to be done if a patient present with a tooth ache. So a dental curriculum should be introduced in the nurses undergraduate training program and the program should be housed a public health dentistry department as a part of community nursing. Aim: To assess the knowledge and attitude towards evidence based practice among dental practitioners of Bangalore city. Materials and methods: A cross sectional survey was conducted on a sample of 200 dentists in Bangalore city. The survey instrument consisted of 18 pre tested structured questions. The questionnaire was distributed to dentist and collected personally. Results: Of the respondents, 73.5% were B.D.S and 26.5% were with M.D.S qualification. Most of them 78% were practicing for 2-5 yrs. The knowledge score between BDS, MDS groups were significant (p 0.001). The correlation between knowledge and attitude in practitioners with BDS degree was found (0.009) to be no association. Where as for MDS found (0.034) to be negligible association. Conclusion: Dental practitioners surveyed in this study were enthusiastic & expressed a desire to find out more information about evidence based dentistry. It appears to be the right time for an educational programme targeted at general dental practitioners to enhance their knowledge and use of evidence based dentistry in every day practice, using a systematic approach with strategic planning. Infection control is the guard for protection of patients and dental health care personnels against various infectious diseases in dental offices. Infections such as Hepatitis B and C, together with the public concern over human immunodeficiency virus, have been highlighted through incidents of cross infection between dental personnel. These transmissions have led to the close examination of how infection control principles are employed within dentistry. The association of anti-asthmatic drugs on dental caries status of 4-16 year old asthmatic children was assessed. A cross-sectional study was done on 430 asthmatic children aged 4-16 years. The details on various combinations of anti-asthmatic drugs, forms, oral hygiene practices and snacking habits were obtained from patient's records, by consulting the pediatrician treating these children or by interviewing their parents/caregivers. Dental caries status was assessed using DMFS (Decayed, Missing and Filled Surfaces) and dmfs (decayed, missing and filled surfaces) indices along with application of WHO modification, 1987. Majority of the children (34.6%) used combination of inhaler, syrup and tablet forms of drugs and were prescribed Group II ( 2-agonist corticosteroids) medication (41.9%). The prevalence of caries in primary teeth (dmfs) among 4-10 years age group was found to be 32%, whereas permanent teeth showed caries prevalence of 21.4%. Among 11-16 years old subjects DMFS was 28.6%. Primary teeth caries experience was significantly higher in children given Group I ( 2-agonist) medication in the form of inhaler and syrup form whereas DMFS was more among inhaler group. Asthmatics experience higher dental caries compared to the healthy individuals and those prescribed 2 agonist alone in the form of inhaler and syrup are at a higher risk of caries. Vitamin D has emerged from obscurity, and its effect on various organ systems throughout the body down to the cellular level is being discovered. What was once thought to be a simple hormone affecting only bone and calcium metabolism has shifted. Vitamin D is now seen as a complex hormone that is involved not only in the calcium homeostasis but also in the integrity of the innate immune system. Reduced serum Vitamin D is linked to inflammatory and long- latency diseases like tuberculosis, arthritis, diabetes ad even gingivitis. Research on the importance of prescribing Vitamin D as a therapeutic and preventive measure in routine practice for many diseases including Gingivitis and periodontal disease is in full swing. Background: This paper assesses oral health status of inmates in central prisons of Karnataka State, India. Keywords: Inmates in prison, Epidemiology, Dental caries; Methods: The study area was divided into 4 geographic zones, and participants were selected by stratified cluster sampling technique. A total of 2160 subjects were included in final study which were divided among the four age cohort (18-25, 26-34, 35-44, 45-54 and 55 and above respectively following the guidelines for research methodology recommended by WHO oral health surveys 1997.Clinical examination was conducted by one of the three examiners with the aid of an artificial light source. The agreement (kappa statistics) for diagnosis of DMFT and CPI was determined (field teams versus expert) 91.2% two days prior to the examination. Data was analyzed using Bivariate and multivariate analysis. Results: The mean DMFT were (5.22 2.46) and the caries prevalence was 71.1% with maximum prevalence in 45-54 years. DMFT score increased with increasing age with maximum with 8.15 at 55-64 yrs aged inmates. Also increased DMFT was associated with duration of stay at the jail, frequency of teeth brushing and consumption of tobacco. Higher prevalence of periodontal disease was present with only 1.75% having healthy gingiva. Mean number of sextant involved was maximum among 35-44 years. Tobacco consumption and Stress among prisoners have shown highly significant relationship with CPI scores (p 0.001). Fracture of tooth, mainly maxillary central incisor was high (11.5%)as a mark of emotional and criminal conduct. Conclusions: The findings highlighted the high caries prevalence, higher periodontal disease which requires immediate attention. Prevention of tooth fracture and improvement of overall nutritional status, with stress reduction protocol should also be given consideration. Background: AIDS considered as the modern pandemic of the world with India's HIV/AIDS prevalence being second in the world. Oral health issues have been identified as a significant health issue in HIV-infected individuals. Oral diseases, if unchecked can lead to malnutrition and inability to adhere to life-sustaining HIV medication regimens. The house surgeons are the persons who frequently come across HIV/AIDS patients thereby playing an important role in diagnosing and rendering treatment to these patients. Objective: To assess the knowledge, attitudes and practices regarding oral manifestations of HIV/AIDS among medical and dental house surgeons in Davangere city, Karnataka, India. Methodology: A total of 300 medical and dental house surgeons of one medical college and two dental colleges of Davangere city were included in the questionnaire based survey. Results: Majority of the respondents (81%) had come across an HIV/AIDS patient in the hospitals. 76% of respondents said they do perform an oral examination and 72.9% respondents identified oral candidiasis as the most common oral lesion seen in HIV/AIDS patient. Only 39% of the respondents were aware of a diagnostic test for HIV which uses oral fluid. Only 26.9% of the respondents have referred cases to the dentists for opinion. Vast majority (89.7%) said they require further training. Conclusion: The present study indicates that house surgeons are less well prepared for their future task of diagnosing and treating patients with oral manifestations of HIV/AIDS and thus highlights a need for improving the curriculum regarding oral manifestations of HIV/AIDS. Background: Pharmacists have been regarded as the second most source of advice on general health matters they are the first port of call when people have oral symptoms, such as a toothache or mouth ulcers. There are a variety of ways by which the pharmacist can take a frontline approach to oral disease prevention, identification, assessment, management, and referral. Objective: To assess the Knowledge and attitudes of pharmacists in Davangere city, India regarding oral health care and oral hygiene products. Methodology: A cross-sectional survey among a sample of 106 pharmacists in Davangere city was done and data regarding their knowledge and attitudes towards oral health care and oral hygiene products were obtained using a closed-ended questionnaire. Chi square test was employed to analyze the significance in response in relation to independent variables. Results: Among the 106 pharmacies approached, 56.6% of the participants gave a positive answer when asked whether they had met the dentist practicing close to their pharmacies. Most of the pharmacists stocked oral health-related products, which comprised 10-25% of their total stock. Of these products toothpaste was the most common (64.2%), followed by mouth rinses and toothpowder (15.1%). Toothache or painful teeth was the most common dental problem (76.4%) for which patients approached the pharmacists for advice. With regard to the advice given, 36.8% of the pharmacists asked the patient to consult a nearby dentist, 15.1% of the pharmacists dispensed antibiotics and painkillers without any referral. Many of them (39.6%) felt that lack of proper knowledge is a barrier to providing oral health care advice. Conclusion: It is clear from the present study that pharmacists are presently an underutilized resource, and there is a definitive need to improve their training and access to information on available dental services. Background: Prevalence of dental caries is used to quantify inequalities and identify high risk groups, for timely targeted interventions. SiC Index and the assessment of what percentage of the population has 75% of caries burden is used to quantify polarization. This study was conducted to assess the caries prevalence and polarization among third year undergraduate dental students in a dental teaching institution in Bangalore, India. Method: Data was obtained from the Departmental records. DMFT index given by Klein, Palmer and Knutson,1938 was used to record the Dental Caries Experience. SiC Index and Cumulative frequency curves were used to assess polarization. Data was analyzed using SPSS 14 for descriptive and inferential statistics. Results: Data from 3 batches had a total of 145 students, 43 (30%) males and 102 (70%) females. Caries prevalence was found to be 62.75%. The mean DMFT values of male and female students for the batches 1, 2 and 3 were 2.1 2.2 and 2.6 2.3, 2.3 2.7 and 1.9 2.4 while the SiC Index scores were 8.3, 4.3 and 4.1 respectively. 75% of dental caries was found in 32% of the total study population. Marked male: female differences in polarization was observed [5% males experienced 75% of caries compared to 25% females]. Among the 3 batches, 14% of the students in batch 1 and 2 and 21% of batch 3 student experienced 75% of dental caries. Discussion and Conclusion: 75% of dental caries was found in 32% of students showing definite polarization of caries experience. The identified high risk group provides an ideal setting in a dental institution to plan, implement and evaluate appropriate dental public health strategy especially as part of the undergraduate training program. Aim of the Study: The current study aimed to review the scientific evidence for regular dental checkups and explore the opinions of the dentists in the Indian Dental Association (Deccan Branch) on the current dental recall procedures in relation to dental caries and periodontal diseases. Method: It is an exploratory study by using a self administered standardized questionnaire. The results obtained from the study are to be used as the starting point for the future consultation in framing a dental recall policy by Indian Dental Association and to initiate discussion and debate among the dentists on the current dental recall procedures. Results: Out of 330 members of IDA (Deccan Branch), 100 dentists were requested to participate in the study. The response rate was 73% with 54 male dentists and 19 female dentists. The opinion survey provided a representative overview of opinions on the dental recall intervals among dentists of Indian Dental Association (Deccan Branch) in Hyderabad. Results showed that the respondents' knowledge on oral diseases and effectiveness of some oral health care procedures was not compatible with the findings from the review of the scientific literature. Dentists are following the dental recall intervals based on their own practical considerations. In general, respondents preferred shorter recall intervals than annual recall intervals. Conclusion: Based on the evidence of the literature reviews and findings of the opinion survey, it is recommended that a recall policy should be maintained but consideration should be given to extend it from annually to 2 yearly for the majority of adults. To update the dentist's knowledge on evidence based dentistry there should be more continuing professional education courses on current concepts of the life history of dental diseases and principles of screening and oral health preventive measures. Background: Extensive review of literature revealed that except for oral cancers and potentially malignant oral conditions, very few studies have been reported to document the prevalence of entire range of possible oral mucosal lesions among outpatients. The early diagnosis of certain oral mucosal lesions can effectively prevent the complications and fatalities. Objectives: 1. To find out the prevalence of oral mucosal lesions and its awareness. 2. To find out the prevalence of deleterious habits and other risk factors associated with various oral mucosal lesions. Methodology: A total of 7500 outpatients [4069 males and 3494 females] aged 3 to 80 years were examined during a period of 10 months using type III clinical examination as suggested by ADA. For diagnosis of the lesions WHO, Axell's and Pindborg's criteria were used. Results: The overall prevalence of various oral mucosal lesions was found to be 15.9%, highest being smoker's melanosis 1.3% and least being herpes labialis 0.1%. It was observed that 22.9% of the outpatients had various deleterious habits with significant higher prevalence among males 35%. Significant higher prevalence of lesions 32.1% was found among patients with various habits. Conclusion: The study suggests that overall prevalence of oral mucosal lesions was high and most of the patients with lesions were unaware of their presence. There is a great need to lessen the prevalence, to increase the awareness regarding oral mucosal lesions and also to prevent the deleterious oral habits. Objective: To determine the prevalence of third molar impactions among rural population of Dharwad district, Karnataka, India by clinical and radiological examinations. Method: A cross-sectional survey was conducted involving 630 rural subjects. A two stage sampling procedure was adopted in the selection of the sample. The data was collected using a pre-designed proforma by a single trained and calibrated examiner with a recording assistant. Data was analyzed by STATISTICA-6.0. Results: The overall prevalence of third molar impactions in the study population was 14.92%. There was no gender wise significant difference in the prevalence of third molar impactions. Conclusions: Significant differences were noted for third molar impaction between maxillary and mandibular arch. The prevalence of third molar impaction was more in mandibular arch. Objectives: This study was conducted to assess the influence of frequency and duration of smoking on the periodontal status and to compare the periodontal status among young smokers and non-smokers. Materials and Methods: This study was conducted among 961 employees of Nuclear power station kaiga, karawar, Karnataka. Information on smoking habits along with frequency and duration was collected by using a specially designed format. The periodontal status was recorded by using CPI index. Data was analyzed using SPSS. Results: Mean number of sextants per individual with periodontal pocket measuring 4 mm or more was observed significantly higher (p<0.001) in smokers compared to non-smokers. Mean number of sextants per individual with loss of attachment of 4 mm or more was observed significantly higher (p<0.001) in smokers compared to non-smokers. Severity of Periodontal disease was evident with increase in frequency and duration of cigarette smoking. The risk of developing periodontal pocket and loss of attachment was 9 times and 6 times more among smokers respectively. Conclusion: The severity of periodontal disease depends on the frequency and duration of smoking habit. Therefore smoking is risk factor which is strongly associated with periodontal problem. Objectives: The purpose of this study was to assess the Oral health Knowledge, Attitude and Behaviors of different Professional College (Agricultural, Pharmacy, Law, Engineering and Medical) Students in Hubli-Dharwad, Karnataka, India. Materials and methods: 500 students from different professional colleges were selected for the study. From each college 100 students were selected randomly by using simple random sampling technique. The data was collected by pre-tested questionnaire on Oral health Knowledge, Attitude and Behaviors. Results: A higher mean score of oral health knowledge was observed in Medical students (297.20) compared to Pharmacy (248.40), Law (247.37), Engineering (243.30) and Agriculture (216.15). A better attitude towards oral health mean scores were observed in Medical students (260.93) followed by Agriculture (256.94), Engineering (249.80), Law (246.63) and Pharmacy (238.2) students. But a significant higher oral health behavioral scores were found in Pharmacy (272.59) followed by Law (269.76), Agriculture (265.24), Engineering (254.59) and Medical (189.33) students. Conclusion: Medical college students have significantly better oral health knowledge scores (H=43.7600, <0.01, S) than the other professional college students. But, Pharmacy students have significantly higher behavioral scores (H=52.3400, <0.01, S) than the other professional college students.